We looked a long time to find an all natural way to revitalize our soils. The Humate Soil Conditioner by Live Earth is that product. Our tests show Humate Soil Conditioner allows plants to grow faster, with increased disease & pest resistance, as well as having a more healthy, greener color. 4 to 6 weeks after our initial application, we were able to reduce the amount of water and fertilizer needed by 20% to 50%. We found that this product actually saved us money. Our savings in much reduced fertilizer and water far exceeded what we paid for this product and our yard never looked better. 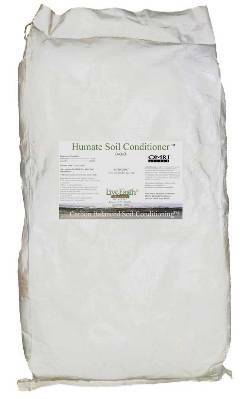 If your soil is poor, and your lawn, trees & shrubs do not grow well, Humate Soil Conditioner is for you.